Super nice hostel! Everything is clean, the staff is amazing, the atmosphere is great and the location is also nice and safe. There is nothing to complain about and I would definitively recommend this place. I already stayed two times in this Hostel because the staff is just amazing and it’s easy to feel at Home there right away! The beds and especially the blankets are very comfi, everything is very clean and cozy, the rooftop is a beautiful spot for breakfast, chill or to meet up with people at the bar at night. The breakfast even includes pancakes and the location is perfect as you only walk 5min. To the sea but also to restaurants etc. Best place to stay in Lima! We had a wonderful time in Alpes Lima. The included breakfast was very tasteful. There was always a familiar atmosphere and the whole staff are very helpful and friendly. Especially Jhemm, Gustavo and Carmen helped us with all the questiones we had about Lima and we had great nights at the bar with them. 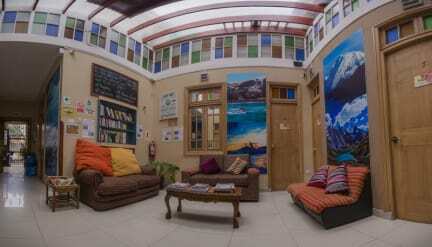 We would recommend this hostel and if we come back, we will go there again. Amazing place!!! Fell in love with the cute bartender on my last night. 😘 Danke für die Blumen! Wir waren im Gebäude, in dem sich die Doppelzimmer befinden. Es war recht laut, in der Nachbarschaft wird gerade ein Hochhaus gebaut. Im Gebäude wird gerade das Hostel vergrößert. Demnach war auch der Lärm im Hostel sehr groß. Unser Zimmer war ziemlich klein.